The NVIDIA GeForce GTX 675M SLI is a high-end graphics solution for laptops based on the two GTX 675M graphic cards in SLI mode. With SLI, each card usually renders a single frame (AFR mode). Therefore, it may suffer from micro stuttering in low fps ranges of 30fps. This happens because of different timespans between two frames (e.g., irregular delays between sequential frames). The GeForce GTX 675M SLI supports the same features as a single GTX 675M card. Therefore, it supports DirectX 11 and is produced in a 40nm fabrication process at TSMC. Technically, the GTX 675M (SLI) is completely identical to the GTX 580M (SLI). The GF114 core is a power-optimized version of the GF104 (used in the GTX 485M), but with no architectural changes. Therefore, the performance per MHz stays the same. Nvidia, however, was able to clock the shaders higher while still remaining in the same power envelope. The GTX 675M offers all 384 shader cores in the GF114. More information on the similar GF104 architecture can be found on the GeForce GTX 485M page. Due to the higher clock speeds, the GeForce GTX 675M SLI is faster than the GTX 485M SLI an as fast as the GTX 580M SLI. Demanding games like Crysis 2, Witcher 2, Dirt 3 or even Metro 2033 can be played in 1920x1080 with maximum details and most Antialiasing features enabled. Similar to the older GF104 chip, the GF114 also supports Bitstream HD Audio (Blu-Ray) output via HDMI. That means it can transfer, for example, Dolby True HD or DTS-HD bitstream without quality loss to a HiFi receiver. The GTX 675M offers the PureVideo HD technology for video decoding. The included Video Processor 4 (VP4) supports feature set C and is therefore able to fully decode MPEG-1, MPEG-2, MPEG-4 Part 2 (MPEG-4 ASP - e.g., DivX or Xvid), VC-1/WMV9, and H.264 (VLD, IDCT, Motion Compensation, and Deblocking). 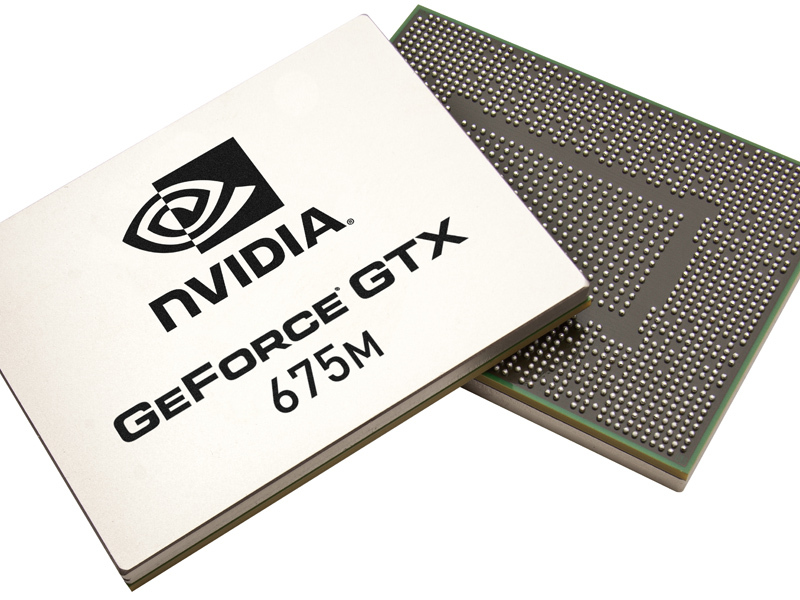 Through CUDA, OpenCL, and DirectCompute 2.1 support, the GeForce GTX 675M can be of help in general calculations. For example, the stream processor can encode videos considerably faster than can a fast CPU. Furthermore, physics calculations can be done by the GPU using PhysX (e.g., supported by Mafia 2 or Metro 2033). As two 675M are used for the SLI combination, one card alone can be used for PhysX and the other for rendering the game graphics. 3D Vision enables the laptop to send 3D content (3D games, 3D Web Streaming, 3D photos, 3D Blu-Rays) to a built-in 3D enabled screen or an external 3D TV (only if supported by the laptop manufacturer). The power consumption of the GeForce GTX 675M is in the same region as the old GTX 580M, which is supposedly about 100 Watt (TDP including the MXM board and memory). Therefore, the SLI system needs up to 200 Watt using both cards. Without load, the performance is clocked at 50/100 MHz (chip/shader) in 2D mode and 200/400 in 3D mode to save power. Furthermore, a single card can be deactivated to save power. The similar desktop GeForce GTX 580 is based on the GF110 chip and much faster in comparison. Therefore, the 675M is more closely related to the GeForce GTX 560Ti, the latter of which is still faster due to higher clock speeds.